“I had a lovely stay at Jen’s and her husband Lee’s place. Lee picked me up from the airport and brought me back to the farm in the middle of the sugar cane. I had a spacious bedroom with a comfy bed and an own bathroom. The surrounding with the garden and the little lake is so peaceful. Their 4 dogs seem huge, but they are very well educated, they don’t jump or frighten you, they only want to be hugged 😉 Jen cooked every day for us and she decorates every plate with so much love as it is a little piece of art, and the food is amazing! We had lunch and dinner together and had the option to have a chat afterwards or have some time on our own. She wanted to make sure everybody gets a good education in the teachers training, that is why she prefers smaller groups. Jen is such a warm hearted, honest and positive person, that want to make yoga accessable to as many people as possible all over the world. I highly appreciated the fact that she explained the secrets behind yoga not only in a spiritual way but also in a scientific based way (several studies have already been published all over the world). I felt like a part of the family when they organized a game drive and a visit to an awesome farmer’s market (where you can shop and eat deliciously) for us. I can totally recommend enjoying yoga at her place, no matter how much ecperience you have or how flexible you are. You’ll have an amazing time, get useful tool to manage stress and memories that last forever. Pathways Academy of Life yoga teachers training program was the perfect classical yoga teachers training course for anyone interested in gaining a deeper knowledge about all the eight limbs of yoga, how to structure and teach a yoga class as well as including Yoga Nidra, meditation and breath work. I feel that I walked away from this course not only with a 200 hour yoga certificate under my belt, but also with a vast amount of invaluable knowledge that I had gained from both the brilliant theory and practical classes. The course covered everything a teacher wanting to start in the industry would need to know. The content included everything from physiology, psychology, Chakras and asana’s to meditation and Yoga Nidra and an introduction to Ayurveda. I found the practical classes to be enlightening – Jennifer always taught effortlessly, conveying her knowledge while paying attention to each person’s individual needs. Being in the quiet, rural, hills of inland Kwa Zulu Natal, South Africa mad me feel at ease in the tranquil and peaceful setting of the lodge. My room was very beautiful and unique and I immediately felt comfortable and at home. The owners looked out for our every need, and even catered for all dietary requirements. All in all I would suggest any aspiring yoga teacher at attend this yoga teachers training program. On completion of the program I felt confident in my knowledge of yoga and all that it entails – theoretically and in practice as well as feeling confident in myself and my ability to go out into the world and teach yoga to others. Zita Visnensa from Johannesburg. An experience everyone should go through if they want to change their lives. Coming away from this retreat, I feel stronger happier and most importantly love myself more than ever before. Jen is an amazing host, set in a beautiful house with delicious food, drink and company. Thank you for an amazing experience. Namaste. Azi from London. It is a week since I have been home, since the beginning of my new journey. After leaving Pathways I new I had to change a lot. I knew that I had to take charge of my new life and to be present. You taught me so much and for that I am truly grateful. I will forever cherish your teachings and will always call you out of the blue just to confirm things and just to fill you in on my journey. Thank you for your love, kindness and your time. I am sending you this email to also thank you for helping me gain my strength to deal with issues I thought I would never face. You unleashed a whole new game ball and I am living everything about it. Thank you so much Jen. You will always be my mentor I look up to your amazing teachings. This is also to confirm that the readings are slowly but surely coming true. I am still in shock that all is as it should be. I miss you so much Jen & Lee you don’t understand my amount of happiness and gratitude. Feefee from Potchefstroom. Pathways Country Yoga Retreat is a sanctuary that allows you to both find yourself and be yourself. Jen and Lee are phenomenal souls, they open their home to people looking for solace and to those who wish to study the greater journey and purpose of life through yoga. The practices and the teachings that Jen edifies is a way of life which I have adopted and cannot see myself going without. I would definitely return and suggest anyone interested in a life transforming retreat to visit Pathways. Bianca from Johannesburg. I had a wonderful time at Pathways Country Yoga Retreat. Jennifer is a wonderful, empathetic and excellent instructor. She and her husband Lee are incredibly hospitable and opened their home to us. I learnt such a lot in the beautiful natural surroundings. I just wish I had booked more than four days with Jennifer. Food for the soul. Linda from Denmark. I am deeply grateful that the Universe lead me to Jen and Pathways Country Yoga Retreat. This experience has enabled me to tap into self awareness and spiritual consciousness that I have been seeking for years and was unable to get from my previous (asana focused) yoga practice. As I write this review from Australia, I miss Jen and the beautiful energy of the retreat and her home, with my whole heart. I initially signed up to do a week retreat, but loved it so much (especially the workshops and the knowledge that I gained about the science and philosophy of yoga) that I returned the following month for the Teachers Training Course. Now I can’t wait to begin my teaching. Jen has a very gentle, holistic and traditional style and approach which suited me perfectly. I felt so welcomed by both Jen and her husband Lee. The food they made me was absolutely delicious, healthy and full of love. The setting is stunning, the bed comfy and the bath is a delight. The Pathways to Wellness program offered me a life changing experience and a new way of living. Jen’s extraordinary insight, her humility and the kindness she shares in all her teachings are beyond a gift. Having recently been struggling with anxiety and stress, my regular once a week yoga class didn’t seem enough to keep me in balance. Having practiced yoga and having dipped in and out of meditation for a few years now, I had struggled to maintain a daily practice and consistently feel the benefits. Jen’s program turned this around for me. I realized that I wasn’t fully committed to the discipline because I didn’t fully understand it. Jen taught me how the practice of yoga is so much more than the 20 or so poses constructed in the class but rather a tool to achieving physical, mental and emotional balance as well as overall wellness. The sessions varied from breathing, exercise, meditation, mantra and energy work to developing an understanding of the vibrations of the Universe. Each session helped me to understand the route to achieving wholeness and balance. My four days were jammed packed with knowledge, practical techniques, exercise and life coaching. Most important I found the teachings emphasized how I could achieve this balance by integrating the core techniques back into my fast pace lifestyle on my return from the retreat. The backdrop to all of this, a beautiful farm house set amongst wildlife and dams with a yoga studio which absorbs the sunrise, sunset and amazing views of the farm. Jen and her husband Lee, brought me into their home, cooked the most beautiful food and couldn’t have made me feel more comfortable. There was a lot of free leisure time to explore the farm, walk the dogs, go fishing and relax. What I liked most was how the amount of leisure versus practical time, was dictated by what I felt I wanted and needed – rather than the other way around. And this was central to my whole experience at the retreat as it was personalized for my specific needs – rather than generalized practice. The farm is set amongst a close farming community, in a beautiful and secure location. I felt very safe and well looked after and couldn’t recommend a more tranquil setting for such a wonderful, relaxing warm and energizing experience! In summary: Beautiful people, beautiful place with beautiful teachings that will stay with me for the rest of my journey. Thank you Jen and Lee for all your warm hospitality – will be back to stay with my fiancé in a couple of months. – Sophie from Johannesburg, South Africa. It is my supreme pleasure to recommend this yoga teacher training to anyone who maybe in search of it. I travelled quite a distance to come here and am convinced the Universe led me to this place. I know there are many places and programs where one can be trained to teach yoga, but Jen has no prerequisites for attending this one, and she is so supportive, honest and kind. It is hard to put into words how unique and special Pathways Country Yoga Retreat actually is – I thoroughly enjoyed each and every moment of every day that I was there. I cannot say what I enjoyed most – Jen and her personal teaching style; Lee and his love of food and making sure that I was having fun; Sadie, Asia, Sabre and Zulu (the warm, funny and friendly family dogs who led me on daily walks around the farm and always made sure I returned home safely 🙂 or Ntombekaya and Mzoe who lovingly care for the physical property and taught me a few words in isiZulu and isiXhosa – the entire experience was like a dream come true. This course was challenging, inspiring and life changing! Thank you one and all for filling my heart, mind and soul with so much love. – Antonia from The Bronx, New York. It has been a while since I have been in touch. I hope you remember me. I had a wonderful one – on – one couple of days with you earlier in March this year where I also spent time doing my vision board. I hope the family (including the dogs) are all well. Just wanted to follow up with a note regarding the practice and impact on my life. My work demands that I travel frequently and I have many really early starts and late evenings. Where I can, I do my practice and always feel centered and amazing afterwards. The gratitude affirmation I do daily – everywhere and at anytime. It lifts my spirit and my positivity has had an impact on my life significantly. I use my subconscious mind to tailor my life and it has worked! Everything on my vision board have materialized and I am geared towards living my true purpose in life. I have been accepted into an amazing school abroad that I am heading to in November – without a doubt it will help me make a positive impact in the world and leave a legacy some how. Your beautiful story of the universe of love always resonates with me and I remember it often, when dealing with people and situations and your handbook I refer to often. Any way enough of my ramblings : ) I just wanted to let you know that your teachings had the most incredible impact on me – and I will carry it forward for the rest of my life. Perhaps one day soon I will return for a refresher course 🙂 – Trisha from Johannesburg, South Africa. From the moment you step into Jen’s home you feel truly at home. I quickly forgot that I was at a Yoga Teachers Training Course, and not visiting a close relative. Jen and Lee truly go out of their way to make you feel comfortable and booking myself with them was one of the bet things I have ever done in my life. The teachings are in depth, and not only cover the traditional teachers training material, but also include teaching about meta-physics which I truly enjoyed. Jen is an incredible yoga teacher, patient and kind, and what I loved most that there were only two people on the course (limited to a max of 6-8, but Jen prefers to keep it very intimate where possible) and this is one of the reasons I booked with her. Having an intimate retreat meant feeling completely comfortable to transform in any way we needed to. The food was outstanding! I thought yoga courses would mean very bland food, but I was so surprised to see that we had totally delicious and nutritious meals every single day. There were tons of snacks when ever we wanted too. The accommodation was top notch with a stunning bedroom, pool area and the most gorgeous views, and of course a yoga studio filled with love and light. Not to forget the special doggies too. Another great aspect of Jen’s course is that it is all about balance. This means that the weekends are more relaxed, and we were taken on various outings around the area – to a local (awesome) farmers market, a near by game reserve, and every Friday to yoga on the beach. I can highly recommend this teachers training course for any one that would like a broad view of Hatha Yoga. Jen uses her life experience and in depth knowledge to equip all teachers to be with all they need to be wonderful teachers. Three weeks went by very quickly – a glass of wine at night after a long day was well appreciated too. Thanks again to Jen and Lee, and just in case I haven’t said it enough – I highly recommend this Yoga Teachers Training Course. – Jacqui Sive from Hoedspruit, South Africa. I arrived in Eston and just felt at home. Jen and Lee are the most generous hosts and really care for your well-being. The yoga classes were life enhancing and Jen makes it so individual. I think this yoga teachers training course is much more than a “normal” yoga teachers training course. Jen helped me take decisions, without telling me what to do. The food was unbelievably lekka. We also got to know some people from the area and we loved them. Talking about the area; the nature there is incredible, the house is really nicely located and you have dogs helping you to discover the surrounding cane fields. My favorite part of the training were trips to the beach – so beautiful. Conclusion: I loved it! Jen and Lee and my new friend Jacqui are amazing people and I am happy that I met them. Whatever you are searching for, a visit to this place, it’s worth it! – Tanya Tschour from Switzerland. It is with a big smile I write this review, just a few days after my yoga retreat. This was my first yoga retreat and I had no expectations other than doing some yoga every day and having loads of free time just to relax. I was pleasantly surprised with every aspect of it. This is a yoga camp for real people living and working among the rest of society who want to do so living the best life possible. Jen equips you with the techniques thoroughly researched and practiced over many years through difficult times that cover stress management techniques and balancing the physical body, energy body and emotions. You will leave with a heightened sense of spirituality no matter what your faith may be. As other reviews have mentioned the wonderful homemade food, the dogs that are the epitome of love, the peaceful surroundings and wonderful nature of the hosts make the experience unforgettable and without exaggeration – life changing. The community yoga classes held every now and then is wonderful as you get to meet the locals who are warm and down to earth. I was walking on air when I left and will maintain this as I continue the daily practice with her phenomenal CD’s. – Trisha from Johannesburg, South Africa. The retreat was a great way to de-stress. Jenny and her husband Lee are absolutely awesome. The food, setting and people all great. Lift the retreat feeling much more enriched. Thank you Jenny. – Linda Grove from Johannesburg, South Africa. Thanks again for this great adventure and experiences, it is a milestone in my life and a big step forward. I am safe at home, got again the last seat in the airplane and I am so happy to be at home with a great warm and fantastic feeling in my heart. – Michael from Germany. The entire experience was so much more than I had expected or more than I could ever have hoped for. Firstly I was expecting a week of “yoga” and in my mind this meant a lot of physical yoga classes, strict eating, drinking policy, and definitely a place where I could unwind and spend the balance of my day doing pretty nothing… to de-stress after a tough and challenging year. I was warmly welcomed at Pathways Country Yoga Retreat by Jennifer and her husband Lee. I hardly put my bags down after Lee kindly fetched me from the airport, and a yoga class was about to begin. I was eager to get started and get myself back into my yoga routine, so I jumped right in. Loved it! It was a little different to what I was accustomed to as Jen’s classes included so much more time and focus on breathing chanting and best of all meditation time. 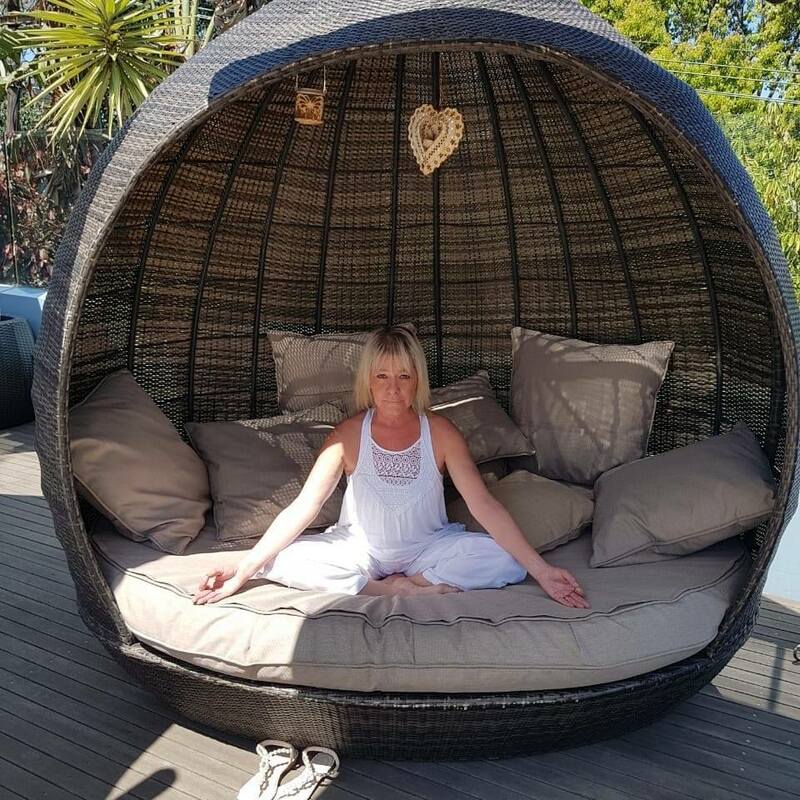 What blew me away was the workshops we had each and every day – the duration was a minimum of two hours each day and what I learnt about the real meaning of yoga philosophy as well as Jennifer’s own life journey and her experiences was powerful and exciting. My life has taken a new meaning and I have made it my life goal purpose to pursue this journey of a life of “yoga”. The accommodation was perfect and comfortable. Apart from the lovely bass dams practically in their back yard, the bird life is incredible. There wasn’t a day that passed when we didn’t hear the Fish Eagles cry. The meals were lovingly prepared by Lee who was ready to whip up my meal within minutes. From a welcoming prawn curry on the first night, to a healthy breakfast made up of fresh pawpaw boats made with yoghurt and muesli, to Jen’s special salmon salad for lunch, the food was delicious with healthy portions. While I had hoped to lose a little of my extra weight during my stay, this became the least of my worries as my focus changed to my learning and practice. I will be returning to Pathways in 2016 with an aim to complete my Yoga Teachers Training, this has been a dream of mine for many years. Thanks and best regards – Namaste. – Theresa Szejwallo from Johannesburg South Africa. Looking for an above and beyond experience for your first step to becoming a yoga teacher or just looking to rediscover your inner strength? I encourage anyone who feels like something is missing or is out of touch with their inner wisdom to take the first assertive step to remembering who you are, make time to look within. If you need some help learning how put your trust in Jen at Pathways Country Yoga Retreat. I cannot recommend this place and amazing empowering woman enough! The farm is so peaceful and beautiful. Jen and her husband Lee are such warm and loving people who make you feel like part of the family from the minute you meet them. You even feel “homesick” when you leave to return home to your new reality. They both go above and beyond what’s expected and what’s paid for and they really are two wonderful souls. I miss Pathways dearly and am so grateful for the tools and life changing attitude Jen has introduced me to. I am so excited for my yoga journey and I highly recommend Pathways. Namaste – Kylee Gouwer from Seychelles. ‘Writing this review is so incredibly difficult for me, solely because I don’t think words can truly describe how fantastic Jen made this course for me. From the moment I arrived on the retreat I was embraced with love and kindness by Jen, her husband Lee and their three loving dogs whom I grew very fond of. I immediately felt welcome and at home. I was escorted to a section of the house where I had a very comfortable room, my own bathroom and complete privacy. I was fortunate enough to have Jen all to myself and received one on one attention which was exactly what I needed. Spending time with Jen from morning until evening, we covered so much information, but the depth of her knowledge, life experiences and insights was what truly made an impact on me. She is a wonderful teacher and a beautiful soul and just so passionate about yoga and its practices. That passion shows in every aspect of her life and I, or any student under her, could not help but be influenced by that blissful energy. Thank you, Jen for sharing so much of yourself with me. I will always hold you dear in my heart. Being the only student at the time, I was not only showered with attention, but got spoiled all the time. Jen and Lee took me all over, showed me the area and shared some of their favorite places with me, namely the farmers market, the wild reserve and yoga sessions on the beach. Being a pescatarian, no meat, only fish, Jen and Lee catered for all my dietary requirements and made such a comfortable adjustment to their lifestyle. Awesome barbeques and the most delicious soups I have ever tasted! The meals were always so creative, so healthy and nutritious and such a treat. The Pathways Country Yoga Retreat grounds are beautiful with views over 2 little trout dams and the greenery of the sugar cane fields. This peaceful atmosphere is the perfect setting for meditation and spiritual work. I signed up for the 200-Hour Yoga Teacher Training and the 10 Days Meditation Facilitator course with Jennifer. The yoga teacher training course is very comprehensive and Jen covers not only the syllabus but any other points you as student might want to explore–like opening a yoga school, offering meditation workshops or energy healings. I found Jen to be a capable and patient teacher. Her books, CDs and DVDs are great aids that can help you strengthen your practice. She has a wealth of knowledge that she shares eagerly with her students. Jennifer Fitzsimmons does an amazing thing: she teaches yoga deeply on every level, and this is what appealed to me most; the irrefutable scientific wisdom that creates the doorway to mental, physical and spiritual health. She confirmed my belief that what we refer to as ‘Supernatural’ is nothing more than the ‘Very Natural’ skills we have forgotten. Her understanding of the physiology / spirituality connection, combined with her no-nonsense practical application of yogic principles, is refreshing and highly effective. I came to her looking not so much for enlightenment but for tools – and found both – in bucket loads. I now know that what my body needs is energetic nutrition as much as it needs food. And this is what creates the balance we all crave – often without realizing it. Thank you, Jennifer. And thank you to your wonderfully generous husband, Lee, for the support and hospitality he provides in the very beautiful environment you have created together. – Sonya Culverwell from Johannesburg, South Africa. We have not officially met but I owe you an enormous thank you. You and your husband have taken Karin into your home for the last month, have taken excellent care of her, and treated her like royalty. She has learnt an extra ordinary amount from you. You have given her the tools and the confidence to succeed in whatever endeavor she plans to undertake. You have given her so much more than what she expected and for that, I will always be grateful. By just speaking to her, I have witnessed the amazing positive changes in her you have brought about. As Henry David Thoreau said, “Go confidently in the direction of your dreams. Live the life you have imagined.” You have taught her how to reach her dreams, that she can live the life she always wanted to. So thanks and thanks again for looking after her and for the beautiful, better, stress less and confident person you are sending back to me. Wishing you all the best going forward and hoping that one day we will get the opportunity to meet. Best regards, – David Lamprecht from Abu Dhabi. Jennifer, Thank you for the most incredible, inspiring and life-changing day! My mom and I left feeling like new people are so motivated to start incorporating your teachings into our lives. We actually started this morning with one of your Yoga DVDs and I have not been able to put your book down. I would really like to book a personal yoga class with you to improve my inversions and I’d also like to have a session of chakra-balancing. I will be in touch to book. Thank you for sharing your beautiful story and practice with us! Kind Regards, – Katy Jennings. To Jennifer, Hello there! I have read your book “Pathway to Wellness” and have related and gained a wealth of information from it. An inspiring book that follows the authors process and journey from successful business woman to a victim of mental and physically abusive relationships to well respected and admired health, wellness and yoga instructor. Her path to peace is not simple or short or a quick fix solution. Jennifer takes you on a journey that needs to be appreciated every step of the way. Her lessons printed at the end of this book enable you to let go and accept your full spectrum of emotions, getting to know yourself again allowing you to make mistakes along the way. After all, the main focus of this book is to make you understand you are part of a much bigger picture. And most importantly, you have to realize that only you have control over your emotional responses and reactions and they can be changed for the better. So it’s also down to you to make sure you purchase this book and change your life just like I have. – Laura van Niekerk – Freelance writer and yogi in training! Hi Jennifer, Thank you SO much for yesterdays class. It was AMAZING and I still feel so much lighter today. I also had such a peaceful nights sleep – it has been a while… I am a chronic asthmatic person and I suffer with terrible sinus and allergies. I know my body is terribly out of balance as I had the WORST year last year – ended up on anti-depressants and therapy. I am a strong minded person but last year I was at every point of weakness possible – my personal life was in shambles. I am hoping to find some balance and peace with myself through Yoga. So…that’s why I am there 🙂 I am also interested in coming along with or your workshops, please keep me on your mailing list for this – my hubby will attend as well. Thank you again. I admire you a lot for everything you have done with your life – to recover.